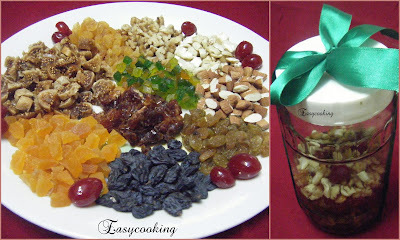 Easycooking: Christmas Fruit Cake ~ Getting ready!! Have you started your preparations yet?I think Christmas being just few weeks away,there is festive spirit all around.Bakeries taking orders for cakes and Christmas wreaths on doors,I love this festival which spreads joy all around.Me,well I wanted to make a Christmas Fruit cake and had planned to soak the dry fruits and nuts in rum long back.But of course,that never happened.As always,I am struggling to zero in on one recipe! !So many yummy recipes all over blogosphere and its just not possible for me to choose one..I want to make them all!! Few months back,Raaga wrote a status message on Fb saying that she was soaking the fruits in rum that weekend for the Fruit Cake.I must have gone through her recipe a thousand times,I mailed her asking the details and she was quick to respond.She cleared all my silly doubts and YES,I am following her recipe this year. So fruits and nuts are chopped,and soaked in Rum. I just can’t wait to bake the cake and EAT it too:). So many choices,which one are you baking?? Can't wait to see how the cake turns out now - Looks like you are getting a headstart on Christmas cooking! Have fun! 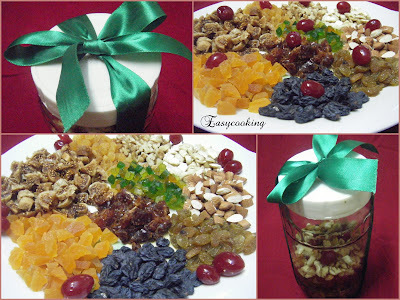 Waiting eagerly to see the christmas fruit cake, u r tempting already with all those dry fruits DIvya.. I brought the fruit mix but i didn't soak yet, probably mine will be ready for New Year! Wow - you have the SAME recipes I bookmarked as well! I've been lazy about getting the fruits ready, I think i am going with Annita's or Mishmash's.